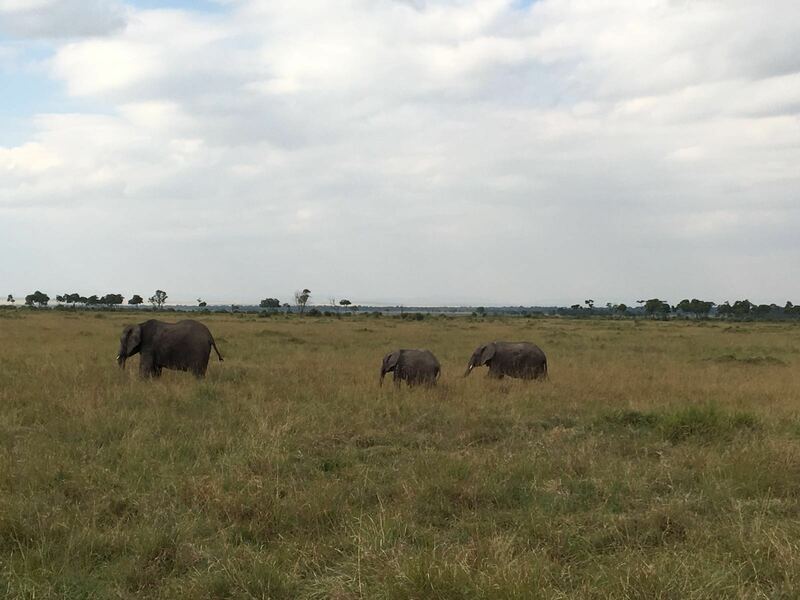 Day 2 (cont’d): we were quickly rewarded for the long and extra bumpy drive when we saw a small group of elephants soon after entering the park. We’d see far more afterwards, but the first sighting is always exciting. There used to be far greater numbers of elephants in the park but tens of thousands have been killed for their tusks, nearly being wiped out in the 70’s. 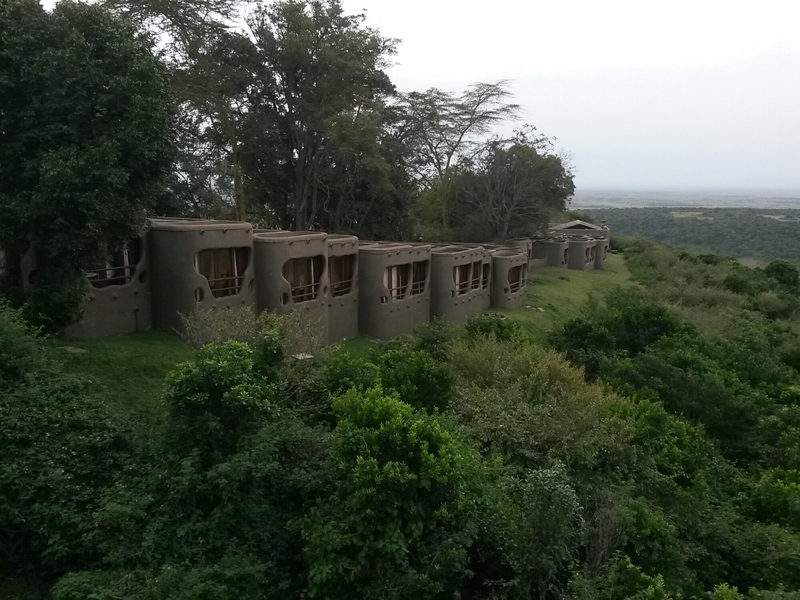 Kenya has since set aside large natural conservation areas, with a successful business model for attracting tourists. Poaching hasn’t stopped completely though, because demand for ivory is (infuriatingly) still strong. We read that in 2014 alone 179 elephants were killed by poachers in the park, a rate at which there will be none left in the Maasai Mara by 2025. If you think that’s bad, consider that every day about 100 African elephants are killed by poachers every single day. I somehow thought this would soon be a thing of the past, but the reality is that poaching is as gruesome as widespread as ever. This NY Times article from 2012 explains how the surge in demand from China is financing heavily armed rebel groups. Even the military of some African countries are involved in poaching and then smuggling blood ivory. This is the kind of thing that really makes my blood boil. I don’t know how to explain this mix of anger, sadness and frustration. Why would anyone want to buy objects made essentially out of keratin, knowing how the material is obtained? There’s some good news too – the Kenyan government has recently made its stance very clear by burning 172M $ worth of ivory. This is the fourth time they’ve burned a large stockpile, and by far the largest. I was surprised at first, thinking in simplistic economic terms that it would drive the price up and encourage poaching. But stopping ivory trade requires firm sociopolitical action first and foremost. This thorough article from The Guardian explains why it makes a lot of sense. Back to our story. We drove straight to the lodge but still saw many animals on the way, including elephants and a couple of giraffes. Have to admit we mostly paid attention to mammals but there are of course also lots of birds in the park, including ostriches, hawks, vultures and the remarkable crested cranes, “immigrants from Uganda”. Bird watchers will not be disappointed. 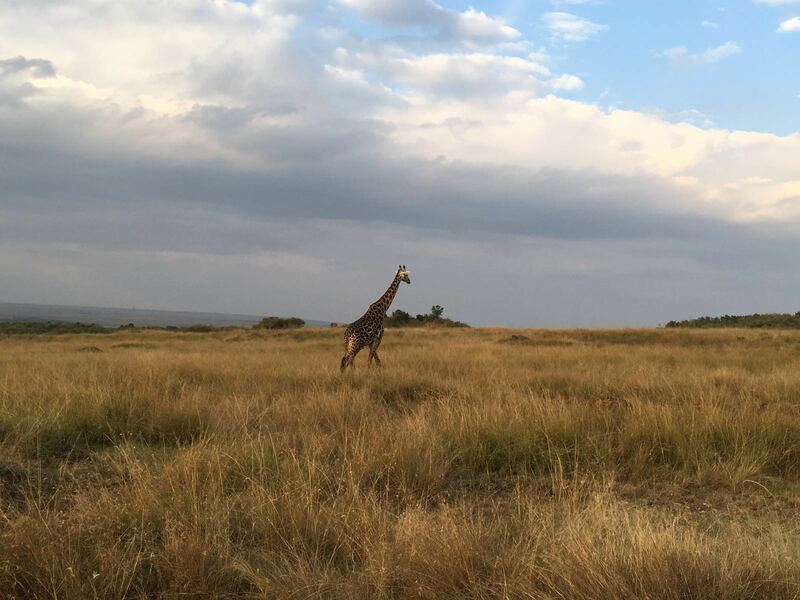 Some giraffes seemed to always hang out next to the hill where Mara Serena is (our lodge) and it was fun to see them every time we left and came back. We missed lunch but with the kind of meals we had for breakfast and dinner none of us ran on calorie deficient diets. After dropping the luggage off our guides took us out for a late afternoon game drive, which was wonderful. We saw a couple of large buffaloes close to the lodge and a half wet hippo munching on some grass on its own. 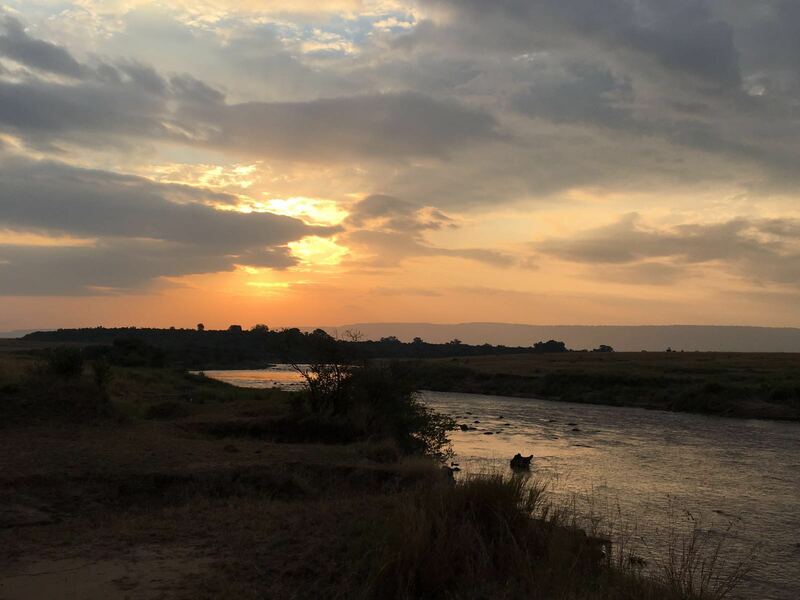 But the best part was driving right next to the banks of the Mara River at sunset, where we saw dozens of hippos in the water and lots of huge crocodiles. Not the best spot for a quick swim. We found out the next day why life is so good for crocodiles in the Mara. Fun fact: (as though they weren’t scary enough already) Did you know that crocodiles never stop growing? Or that they don’t freaking die of old age? It’s great to have a pair of binoculars for such encounters. Mine weren’t good (small ones I keep for sentimental value), but I borrowed an excellent Nikkon pair from a friend the next day and the details you can see when animals are close by are amazing. A must have! At the same time, I really encourage putting the camera/phone aside to let the actual experience sink in. Just try to be present and fully take in the sights and smells. It’s a privilege to visit such a place and a pity to see it mostly through a screen or lens while you’re there. Yet that’s exactly what many people do nowadays, something I also notice a lot at concerts and shows. “If I may put forward a slice of personal philosophy” 🙂 I feel there’s more focus nowadays on recording special events than actually enjoying them. Taking photos to have something to post and share has become so important that it steals time and attention away from the actual experience. Besides that, everything you’ll see on a such a trip has already been photographed by professionals. Of course taking a few photos as keepsakes is fine but snapping pics shouldn’t be an objective in itself. My last argument is that you’re paying good money to be physically present there, not for a bunch of photos and videos that you can get for free online. Ok enough preaching but the day was almost over anyway. 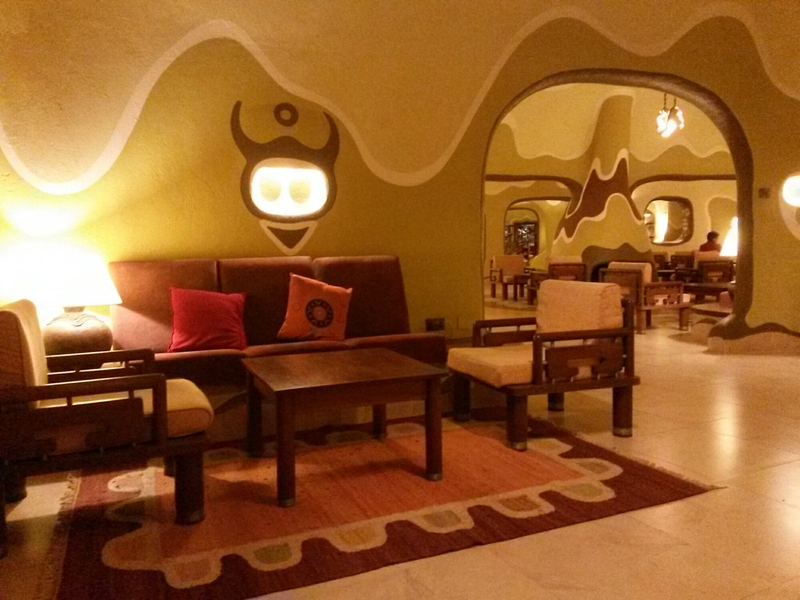 We had a great dinner again at the Mara Serena lodge and I spent some time walking around. I loved the look and feel of this place – the architecture very nicely matches the surroundings. The name really suits the location and it was wonderful to sleep with the wildlife noises from the nearby forest and the valley below. There were quite a few animals to spot in and around the lodge as well: lizards, monkeys and small rodents. Not to mention what we could see in the savanna below (again with good binoculars, unless your friends call you Hawkeye). We called it a day after dinner, knackered after the long trip and knowing we’d wake up at 6am for an early drive. octaxtogo Create a free website or blog at WordPress.com.